We are pleased to announce that our service provider, MiPet, have launched a new product – Active + for Cats. 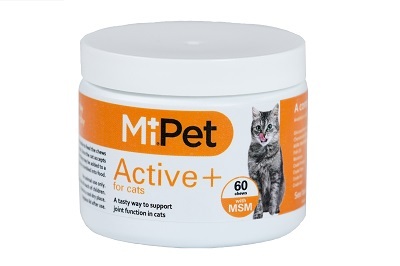 Active + for Cats contains high levels of nutrients that help support joint health such as Glucosamine and Chondroitin. MSM to help support collagen formation and aids tissue cross-linking. It also contains anti-oxidants to aid in the reduction of oxidative damage. The chews are cube shaped to facilitate easy eating in addition to being flavoured specifically for cats. They are available in a pot of 60 chews.